Our Sydney trousers in navy blue are cut for a regular fit with a slight taper at the ankle for the perfect, warm weather ready style. We have developed a mid-weight, beautifully soft and breathable pure linen that will keep you cool and comfortable in even the hottest of conditions. This made in Italy fabric is finished by being piece-dyed before construction for a rich and deep navy blue. 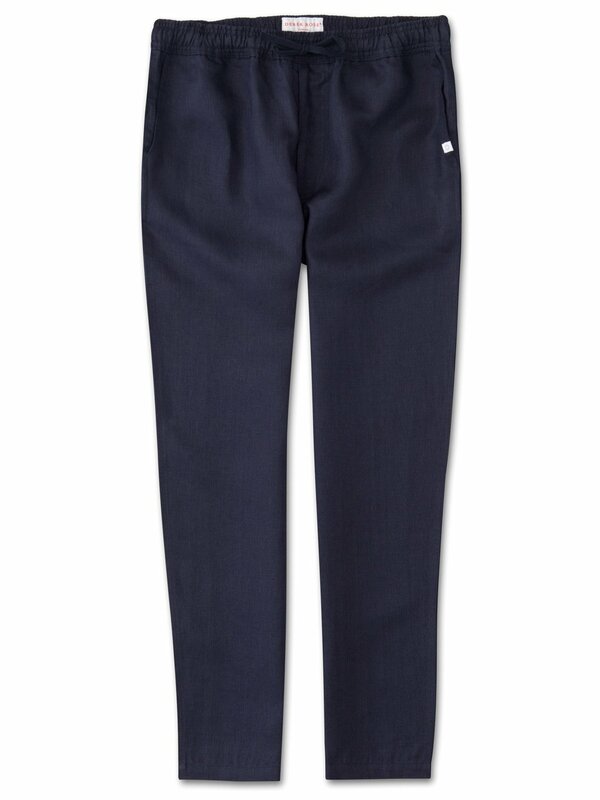 The Sydney trouser features a curved back yoke for a great fit and an elasticated waistband with drawcord for comfort. The front of the trousers feature two angled side pockets whilst the back features a single zipped pocket that sits under the curve of the back yoke. This pocket is closed with our unique pin-lock zip which locks into place when flat to ensure a secure closure. A zipped fly opening and our minimalist rose logo label on the front left pocket finish the look. Wear the Sydney from the villa to the beach or as a cool, smart-casual trouser for sultry evening walks and dinner by the sea.